German chemist who was not only a founding father of organic chemistry, but is notable as an influential teacher. He transformed scientific education, medical practice and agriculture. Decay, its nature. Slow combustion. Relation of decay to fermentation and putrefaction. Effects of decay in nature. Employment of the process of decay in the arts. Bleaching. Manufacture of vinegar by the quick process. Suggestions for improvements in the manufacture of beer and wine. [p.175] The immediate and most energetic cause of all the alterations and transformations which organic atoms undergo, is, as I have already stated in the preceding Letters, the chemical action of oxygen. Fermentation and putrefaction manifest themselves only in consequence of the commencement of a process of decay; their completion is the restoration of a state of equilibrium. Whilst the oxygen is in the act of combining with any one of the elements of an organic substance, the original state of equilibrium of attraction in all its elements is destroyed, the substance decomposes, resolving itself,—all the molecular attractions being again equalised,—into a series of new products, which undergo no further change in their properties unless further causes of disturbance or alteration are brought to operate upon them. Although the chemical action which the [p.176] elements of organic atoms exercise upon each other in fermentation and putrefaction balances itself, inasmuch as a state of rest is induced between the attractions of the new formed products, yet this equilibrium does not exist with respect to their attraction for oxygen. The chemical action of oxygen upon organic substances ceases only when the capacity of the elements to combine with oxygen is exhausted. That action consists in nothing more than the affinity, or tendency of the oxygen to combine with those elements. A perfect equalisation of this tendency, therefore, can only ensue when the elements, by combining with oxygen, have formed such products as are totally incapable of absorbing any additional amount of oxygen. It is only then that the attractions of the elements of organic substances attain a perfect equilibrium with the attraction of oxygen. Fermentation or putrefaction represents the first stage of the resolution of complex atoms into more simple combinations: the process of decay completes the circulation of the elements by transposing the products of fermentation and putrefaction into gaseous compounds. Thus the elements constituting all organised beings, which [p.177] previously to participating in the vital process were oxygen compounds, such as with carbon and hydrogen, reassume the form of oxygen compounds. The process of decay is a process of combustion taking place at the common temperature1 in which the products of the fermentation and putrefaction of plants and animal bodies combine gradually with the oxygen of the atmosphere. No organised substance, no part of any plant or animal, after the extinction of the vital principle, is capable of resisting the chemical action of air and moisture; for all that power of resistance which they temporarily possessed as the bearers of life, the media of the vital manifestations, completely ceases with the death of the organism; their elements fall again under the unlimited dominion of the chemical forces. The clearing of the primeval forests of America, facilitating the access of air to that soil, so rich in vegetable remains, alters gradually, but altogether its constitution: after the lapse of a few [p.178] years no trace of organic remains can be found in it. The soil of Germany, in the time of Tacitus, was covered with a dense, almost impenetrable forest; it must, at that period have exactly resembled the soil of America, and have been rich in humus, and vegetable substances, but all the products of vegetable life in those primeval forests have completely vanished from our perceptions. The innumerable millions of molluscous and other animals, whose remains form extensive geological formations and mountains, have, after death, passed into a state of fermentation and putrefaction, and subsequently, by the continuous action of the atmosphere, all their soft parts have been transposed into gaseous compounds, and their shells and bones, their indestructible constituents, alone remain. It is only in localities, under peculiar circumstances, where the access of oxygen was limited or altogether precluded, that we still find distinct remains of primeval vegetables in a state of retarded or impeded decay, as for example, in beds of turf and brown coal. The presence of water, and a suitable temperature are indispensable conditions of the oxidising process of decay, just as they are necessary to [p.179] putrefaction and fermentation. Perfect dryness, or a temperature below the freezing point, suspends all processes of decay and fermentation. The transmission of decomposition from one particle to another presupposes a change of place; it requires that the particles should possess mobility, or the power of free motion, and this is imparted to them by the presence of water. In decay it is more especially a certain elevated temperature which increases the aptitude of the elements of organic substances to combine with the oxygen of the atmosphere. A great number of organic bodies, when in a moist state, are capable of absorbing oxygen, whilst many, and indeed most of them, are per se entirely deficient in this property. If we place wet saw-dust, or moistened fragments of wood, in a vessel filled with atmospheric air, all the properties of the contained air become in a very short time completely altered. If a lighted splinter,—which of course would burn in atmospheric air,—is introduced after the lapse of two to three hours, its flame will be immediately extinguished. The air confined in the vessel, if examined, will be found to have lost all its oxygen, and to have acquired an equal volume [p.179] of carbonic acid gas. If a fresh supply of atmospheric air is made to replace this, the same process again occurs, all the oxygen becomes converted into carbonic acid. In the process of bleaching in the open air, or, as it is called, grass-bleaching, we have the process of decay applied to an important purpose in the arts upon a large scale. Linen or cotton textures consist of ordinary woody fibre, more or less coloured by extraneous organic substances, which were either contained in the plant whence the fibre has been derived, or have become mixed with it during the processes of preparation. When linen or cotton fabrics are moistened with water and exposed to the light of the sun, a slow process of combustion, or decay, immediately begins upon the whole surface; the oxygen of the atmosphere in immediate contact with the linen or cotton is incessantly converted into carbonic acid. The weight of the fabric diminishes every second, precisely because it is in a state of combustion; all the colouring matters gradually disappear and with them a considerable amount of woody fibre, their elements being converted into oxygen compounds. If this action of air and light upon the linen or cotton continues for a considerable [p.181] time, these substances lose their cohesion and become converted into a matter similar to that used in the manufacture of paper, and this matter still continues to decay as long as the essential condition of this change, that is, the absorption of oxygen, proceeds. The nitrogenous constituents of plants and animals comport themselves towards oxygen in a manner precisely similar to the behaviour of the non-nitrogenous principle we have spoken of, namely, woody fibre. Fresh meat, as well as the first products of the decomposition of the nitrogenous constituents of plants in fermentation, that is, beer-yeast or wine-yeast, withdraw oxygen from atmospheric air, and, like woody fibre, yield in return an equal volume of carbonic acid. When the Cemetery of the Innocents at Paris was removed from the interior of the town to the outside of the barriers, the buried corpses, which had accumulated to a depth of sixty feet, were found to a great extent apparently converted into fat. The substance of the skin, muscles, cellular tissue, and tendons, all the soft parts, and even the bones, had completely disappeared, leaving only the fat, which resisting longest the influence of decay, remained in the form of stearic acid. [p.182] This human fat was employed to the extent of many tons by the soap-boilers and tallow-chandlers of Paris, for the manufacture of soap and candles. If meat be suspended in running water, or buried in moist earth, nothing of it will remain after the lapse of some time, except the fat which it contains. All substances susceptible of decay, when in a moist state, and exposed to the air and light at the common temperature, undergo precisely the same change as they would if exposed to a red-heat, in a dry state, that is, they absorb oxygen,—they undergo combustion. Alcohol, one of the products of the fermentation of saccharine vegetable juices, is altogether incapable of undergoing the process of decay; when exposed to the air, whether in its pure state or mixed with water, it evaporates without combining with oxygen. Alcohol is readily inflammable at a higher temperature, and in burning is resolved into carbonic acid and water. It is obvious that its elements have a powerful affinity for oxygen; the high temperature is, however, a necessary condition of the manifestation of this affinity. Hydrogen gas and many other inflammable substances, are, in this respect, precisely similar to [p.183] alcohol, their affinity for oxygen manifests itself only at certain high temperatures. In the process of decay it has been likewise observed that a substance undergoing this, state of elementary transposition exercises a remarkable influence upon the particles of an adjacent substance, which, per se, would not be capable of passing into the same state of change, decay, or transposition. Many substances, when in contact with another in a state of decay, manifest, at common temperatures, an affinity for oxygen; that is, they enter into combination with this element, at this low temperature, whilst under other circumstances such a combination can only be effected by a far higher degree of heat. The active absorption of oxygen, the combustion of the decaying substance, is transmitted to the particles of other substances in contact with it; they assume its characteristic state of activity; they, like it, combine with oxygen, as if undergoing a real combustion; but how this is effected does not appear to admit any further explanation. Contact with a substance, itself undergoing the process of decay is the chief condition of decay for all organic substances which [p.184] do not possess the power of combining with oxygen at common temperatures. In consequence of the ensuing combination of its elements with oxygen, the temperature of the decaying substance rises above that of the surrounding medium; but great as the influence is which heat exercises in accelerating the process, it is not in this, as in other chemical processes, the cause of the manifestation of the affinity for oxygen. If, in a vessel filled with common atmospheric air, to which a certain amount of hydrogen gas has been added, a linen bag be suspended, filled with wet sawdust, vegetable mould, &c, the process of decay will continue just as it would if they were exposed to the open air. They will convert the surrounding oxygen into carbonic acid. But what is very remarkable in this case, the hydrogen also participates in the process—it undergoes decay; that is, from being in contact with decaying substances, it acquires the power of combining with oxygen at the common temperature. If there be a sufficient amount of oxygen present, all the hydrogen gas is converted into water. Other inflammable gases, both simple and compound, are affected under these circumstances in [p.185] exactly the same manner as hydrogen. The vapour of alcohol, for example, when in a vessel containing wood or other substances in a state of decay, absorbs oxygen from the atmosphere, and becomes transformed into aldehyde, and subsequently into acetic acid, which, upon assuming a fluid state, is withdrawn from the further influence of the oxygen. The transformation of fermented liquors into vinegar formerly required weeks, and even months, to accomplish, in consequence of the imperfect access of the air: we can now convert alcohol into vinegar in less than twenty-four hours; and this is effected mainly by making brandy diluted with water, or any other weak spirituous liquor, trickle slowly through casks filled with wood shavings, and at the same time causing a slight stream of air to circulate through these shavings. This method exposes to the air a surface of alcohol capable of absorbing oxygen by many thousand times more [p.186] extensive than the old method; and consequently the time which alcohol, under ordinary circumstances, requires for its acidification, is abridged in the same proportion. At the commencement of this process it is usual to add to the dilute spirit a small quantity of some substance containing matter capable of undergoing the process of decay, such as beer-wort, honey, vinegar, &c.; but, after the lapse of a very short time, the surface of the wood-shavings passes into a state of oxidation, and from that moment effects the transformation of the spirit into vinegar without the further co-operation of extraneous decaying matter. The application of our knowledge respecting the phenomena attendant upon decay, to the manufacture of beer and wine, is easy and obvious. The property of beer and wine to be converted into vinegar when in contact with the air, depends invariably upon the presence of foreign matters which transmit their own inherent aptitude to absorb oxygen to the particles of alcohol in contact with them. By removing completely all such substances from wine and beer, these lose altogether the property of acidifying, or of being converted into vinegar. In the juice of grapes poor in sugar there [p.187] remains, after the completion of the process of fermentation—that is, after the resolution of the sugar into carbonic acid and alcohol—a considerable amount of nitrogenous constituents retaining the same properties which they possessed in the juice previous to fermentation. This does not happen with the juice of the grapes of southern climates. These grapes are rich in sugar, and a considerable amount of this substance remains undecomposed after all nitrogenous matters have completely separated in an insoluble state, as yeast. Such wines alter very little when exposed to the air: the red wines of this kind, however, acidify, because their colouring matter is of ready mutability, and performs, when in contact with the air, the part of the nitrogenous constituents. The nitrogenous constituents of the grape-juice which remain in wine, after fermentation, are those ferments, or exciters of fermentation in the sugar, of which I have already spoken in previous letters. After the complete transformation of the sugar, they exercise upon the alcohol exactly the same effect as the decaying wood—they are the exciting causes of the ensuing process of acidification. The affinity of these substances for oxygen is [p.188] very powerful; during the short space of time necessary to transfer wine from one cask into another, they absorb oxygen from the air, and induce a state of acidity in the wine, which goes on irresistibly if it be not checked by artificial means. It is well known that this check is practically effected by sulphuration. A piece of sulphur is burned in the cask destined to receive the wine, the contained air is thus deprived of its oxygen, and an amount of sulphurous acid is formed equal to the volume of the oxygen. This newly-formed sulphurous acid is rapidly absorbed by the moist internal surface of the cask. Sulphurous acid possesses a stronger affinity for oxygen than the exciters of acidification in the wine. The acid is gradually diffused from the internal surface of the cask through the wine, and withdraws from those substances, as well as from the wine itself, all the oxygen they have absorbed from the atmosphere, and thus reconverts the wine into the state in which it existed previously to being transferred into the new cask. The sulphurous acid in this process becomes converted into sulphuric acid, and exists as such in the wine. When the wine is stored up in casks to ripen, a constant, although very slow, diffusion of air [p.189] takes place through the pores of the wood, or, what comes to the same thing, the wine is incessantly in contact with a minute amount of oxygen; by means of which, after the lapse of a certain time, the entire quantity of the exciters of acidification, that is, the nitrogenous substances present in the wine, oxidise and separate in the form of a sediment or dregs, termed under-yeast. The separation of yeast from wine or beer, during the fermentation of grape-juice or of wort, takes place in consequence of the absorption of oxygen, or, in other words, is a process of oxidation, occurring in the fermenting liquid. The nitrogenous constituent of barley is in its primary state insoluble in water, but in the process of malting, or whilst the grain is germinating, it becomes soluble in water, it assumes the same condition or nature which belongs to the nitrogenous constituent of grape-juice originally. Both these substances lose their solubility in wine, or in beer, by absorbing oxygen. According to analyses in which we may confide, made with regard to this point, wine-yeast and beer-yeast are far richer in oxygen than the nitrogenous substances from which they are derived. As long as any particles of sugar, in a state of [p.190] fermentation, are present in the fluid together with these nitrogenous matters, the fluid itself supplies the oxygen required for their transformation into yeast by the decomposition of a small amount of the sugar or of water. This oxidising process within the fluid itself, which causes the nitrogenous constituents to become insoluble, ceases with the disappearance of the sugar; but it is renewed if the fluid is reconverted into a fermenting state, by the addition of new portions of sugar, and it ensues also when the surface of the fluid is exposed to the free access of the atmosphere. In the latter case the separation of the nitrogenous constituents is effected by the atmospheric oxygen, and is thus a consequence of their decay or slow combustion. I have already stated that the presence of nitrogenous matters in alcohol causes the transformation of the alcohol into acetic acid when there is a sufficient supply of air; now it is owing to the inequalities in their relative affinities for oxygen, that during the maturation of wine in the storehouse, when the access of air is extremely limited, that the nitrogenous substances alone oxidise, and not the alcohol. In open vessels, under these circumstances, the wine would become converted into vinegar. [p.191] The preceding remarks render it obvious that if we possessed any means of preventing the transformation of alcohol into acetic acid we should be able to preserve wine and beer for an unlimited period, and to bring these liquors into a state of perfect maturity; for, under such circumstances, all those substances which cause wine and beer to acidify would become insoluble by combining with oxygen, and separate from the liquid, and with their perfect removal the alcohol present would altogether lose the property of absorbing oxygen. Experimental art has discovered a means of accomplishing this purpose perfectly. It consists in maintaining the fluid at a low temperature when undergoing fermentation. The method, based upon this principle, and employed in Bavaria, is one which the most perfect theory could scarcely have surpassed in certainty and simplicity, and it seems impossible to devise one more in accordance with science. The transformation of alcohol into acetic acid by contact with a substance in a state of decay occurs most rapidly at a temperature of 95° Fahrenheit. At lower temperatures the affinity of alcohol for oxygen decreases, and at from 46° to 50° Fahrenheit no combination with oxygen [p.192] takes place under these circumstances, whilst the tendency of nitrogenous substances to absorb oxygen at this low temperature is scarcely diminished in any perceptible degree. It is, therefore, obvious that if wort be fermented in wide, open, and shallow vessels, as is done in Bavaria, which afford free and unlimited access to the atmospheric oxygen, and this in a situation where the temperature does not exceed 46° to 50° Fahrenheit, a separation of the nitrogenous constituents, i. e., the exciters of acidification, takes place simultaneously on the surface, and within the whole body of the liquid. The clearing of the beer is the sign by which it is known that these matters are separated. A more or less perfectly complete removal of these nitrogenous substances, however, according to this method of fermentation, depends upon the skill and experience of the brewer. It may be easily conceived that an absolutely perfect separation of them is attained only in rare and extremely happy instances. Nevertheless, the beer obtained in this manner is invariably far superior in quality and stability to that brewed according to the common method. The exceedingly favourable influence which the [p.192] adoption of this principle must exercise upon the manufacture of wine is indisputable. It is too evident to admit of a doubt that it will lead to the adoption of a more rational method than has hitherto been employed. The reason that it has not long since been in use, and that the growers of wine have not derived from it the great advantages it is calculated to afford, is obviously their imperfect knowledge respecting it; nay, I may say the total ignorance of the great majority of wine-growers and manufacturers upon this point. [p.195] The method employed at most places on the Rhine proceeds upon principles the very reverse of this. The wine is left to ferment, not in cool cellars, but in rooms, situate much too high and too warm; the access of air is completely precluded during the process of fermentation by tin-plate tubes, confined with water. These tubes certainly exercise an injurious effect upon the quality of the wine; they are, in every respect, futile—the invention of some idle brain; they serve no object, and yet they are used by people who are too indolent to inquire into the matter, and who are wholly incapable of assigning any reason for their adoption. 1 In order to avoid the ambiguity attached to the word decay, from its being in vernacular language applied to several processes which it is desirable to distinguish, the author proposed to substitute the term Eremacausis, and this has been very generally adopted in scientific treatises, being a convenient mode of expressing the relation of decay to ordinary combustion. An experiment made with red wine in the autumn of 1841, by the same nobleman, had afforded the same favourable results, especially as to the colour of the wine. Before these successful experiments it might have been thought that red wine was the rock upon which this method would founder, but we are now assured of its universal adaptation to the manufacture of wines. Portrait (not in original article) added from source shown above. Text from Justus von Liebig and John Gardner (ed. ), Familiar Letters on Chemistry: Second Series. The Philosophical Principles and General Laws of the Science (1844), 175-195. Science Quotes by Justus von Liebig. 12 May - short biography, births, deaths and events on date of Liebig's birth. 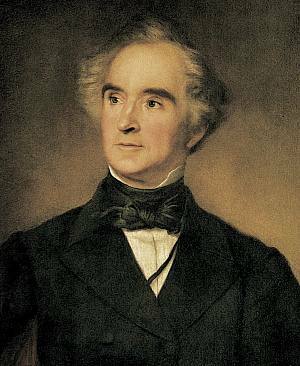 Justus von Liebig: The Chemical Gatekeeper, by William H. Brock. - book suggestion.